Wipaq offers you the right kind of tools when you are hard pressed for space, and yet you have to take safety issues seriously. 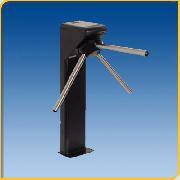 With the ht cat fit model turnstile, you have found the solution for these limitations. It can be installed in any heavy traffic areas such as entertainment parks as theatres or theme parks as well as in the industrial set up. The sleek design occupies much less space and is aesthetically pleasing as well.